Send us your Christmas Crafts and we will post them on our site. This is an easy way to make some memorable homemade Christmas cards this year. With a little tempura paint, sponges, hot glue, paper and some bows, you can create some beautiful cards to send your greetings and Christmas wishes. And don't forget to send us Christmas card craft ideas as well as any pictures that you would like to share. You will need five pieces of sponge to make the tree. (the sizes don't have to be perfect) You can cut a 3/4" x 3/4" square for the trunk. A triangle with sides approximately 1.25" to 1.5" on each side for the top. And three rectangles to form the body of the tree: 3/4" x 1.5", 3/4" x 2", 3/4" x 2.5". Note that you can just cut these to your own fancy. The other way to accomplish this task is to make a tree that is about 4" tall, and then cut it into 5 pieces. Now place some green tempura paint on a paper plate, and dip sponge that is the top of the tree in the paint. Now press this on the front of our card (nearest the top where the fold is) Leave a bout a 1/4" between your paint and the top of the card. Now dip the other four pieces in the tempura paint one by one while pressing the sponge onto your card. Pour a little pit of red tempura paint in a paper plate. Dip your finger in the paint and put around 12 or 15 dot "ornaments" on the green paint. Being sure to not touch your Christmas tree design, you can now put the bow at the top of your card. Tie a bow that is approximately 4" from tip to tip. (you don't want it to hang over each side of your card) Use the scissors to cut the ribbon ends to the desired length. Use the hot glue gun to glue the ribbon at the very top of your tree. 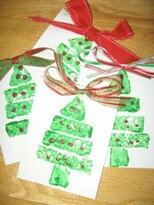 Do you love creating Christmas crafts and would like to share them? Submit an article or site for consideration in our directory. Paste this code on your site.